Each day will be a new adventure when you open your eyes quietly in this beautiful romantic coconut palm grove on the Arabian sea. As you will lean softly to a gentle intrigued feeling of total freedom. Our days will be a perfect blend of reverence for the nature surrounding us. Starting with 2 hours of Prana-Vidya practice with our master Ram Aruvenni, accompanied by healthy nutritious breakfast. Then we'll have free time to catch some waves rest or inquire Goa. Later along the day will be the afternoon session. The Ayurvedic consultation with Dr. Rohit, or an Ayurvedic massage, or a Yoga session, with Doron Noyman, whatever was set for that day. After we picked you up from the airport in Goa, and as we reach our lovely resort, getting our rooms or cottages, we'll meet for a welcome cocktail. 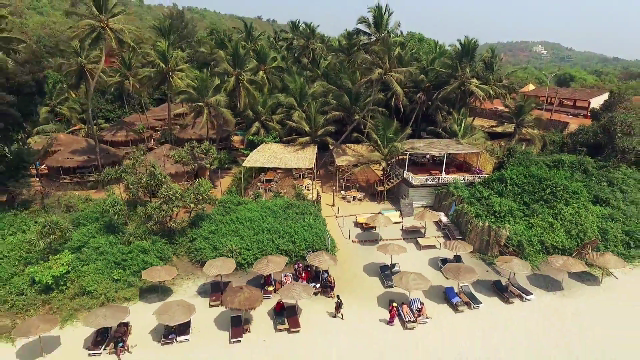 A small introduction party with a D.J.and some vibes, just to get into the vacation atmosphere in ease, inhale the breeze and celebrating our reach to Goa. For 2 hours every morning will be the Prana-Vidya session with Ram, and 4 afternoons will be a Yoga flow, and introduction to meditation with Doron. It is a perfect opportunity to experience Yoga in a different setting when we all tune to the nature vibes around us, and a bit more quiet and relax. Ram Areuveni is a Master of Prana Vidya Yoga from Hokuk Israel. He established Prana Yoga studios in Tel-Aviv, teaches and studies the body and the mind for the last 24 years. At the moment he manage with his wife the Liba Center for Yoga Dance and movement at Hokuk. He has his own Yoga teachers training course, and has trained and certified many Yoga teachers in Israel. Ream began his Yoga path(Sadhana) 24 years ago, and teaches the art of Yoga for the last 20 years. His main focus at the moment is teaching teachers, and he makes workshop in many various places. He studied and pursued many Yoga practices and traditions, such as Ashtanga vinyasa, Iyengar Yoga, Vinnie Yoga, Shadow Yoga, and more. He incorporates his vast knowledge into one unique practice. A knowledge that he gathered from his many experiences in Yoga around the world. In most of the streams and methods which known today. The practice aspires to align a healthy body and mind. And inspired by the alignment of Iyengar Yoga throw the flow and heat of Ashtanga vinyasa Yoga, as with the softness of Shivananda and Vinnie Yoga. All combined to a newer approach of Vinyasa & Shadow Yoga flow. His teachings ties the fabric of the physical and energetic body. Ram Believes that all Yoga takes to the same place of Observation & Awareness, and his Yoga bring you exactly there. Ram lives in the North hills of Israel and besides Yoga he is a musician, and gives therapeutic massages (bio energy and shiatsu). He is married and a father for 3 children. The Ayurvedic workshop will be integrated with our days as well. You will choose one day of going to the doctor for an interesting diagnosis, then some time for a massage. One day will be picked to hear together the Ayurvedic nutrition lecture.